Apple has released iOS 12.0.1 for iPhone and iPad users. 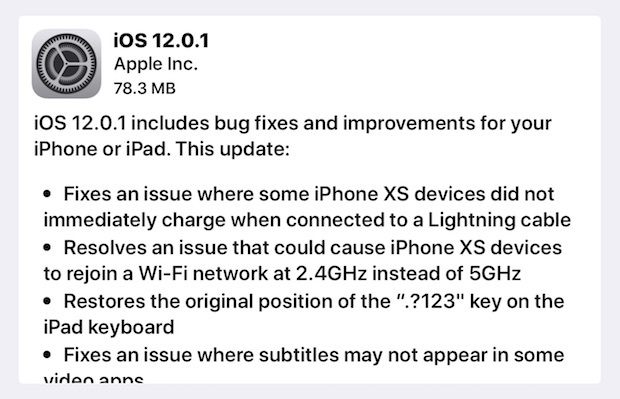 The new small software update resolves multiple bugs present in the prior build and is thus recommended for all iPhone and iPad users who are running iOS 12.
iOS 12.0.1 fixes a variety of problems, including where the iPhone XS and iPhone XS Max were not charging properly when connected to a Lightning cable, an issue with iPhone XS models joining a slower wi-fi band, an iPad keyboard tweak for the “?123” key, an issue with Bluetooth becoming unavailable, and an issue with subtitles not appearing on some videos. Additionally, some security fixes appear to be included in the iOS 12.0.1 software update. The full release notes are included further below, along with direct download links for iOS 12.0.1 IPSW files. Most iPhone and iPad users will find that updating to iOS 12.0.1 is easiest with the Software Update mechanism on their devices. Be sure to back up your iPhone or iPad to iCloud and/or iTunes before installing any system software update. Installing any iOS software update requires the device to reboot. 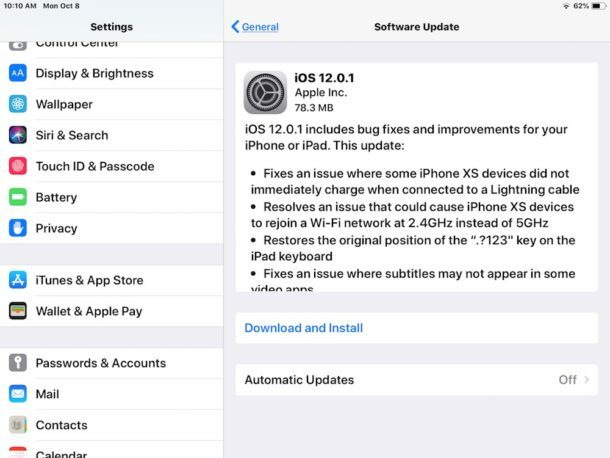 Users can also update to iOS 12.0.1 by connecting an iPhone or iPad to a computer with iTunes and choosing to update software that way. Direct download links for iOS 12.0.1 firmware files are included below, each link points to the appropriate IPSW file on Apple servers. Using IPSW files to update iOS requires iTunes and a computer, it is considered advanced but it’s not particularly complicated. Nonetheless the majority of iPhone and iPad users are better off using the built-in software update mechanism which is a simpler experience overall. If you do not yet see the iOS 12.0.1 software update available yet, or the Software Update section is stuck on ‘checking for updates…’ try quitting and relaunching the Settings app. Similarly, if you see an “Unable to Check for Update – An error occurred while checking for a software update” simply trying again momentarily typically resolves that issue. 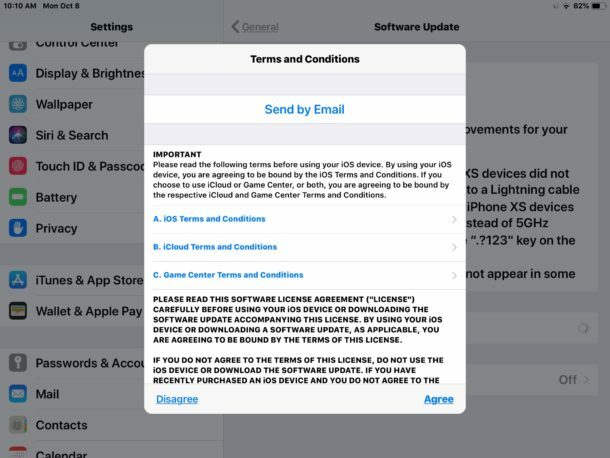 When going to install the iOS 12.0.1 update you’ll have to agree to Terms and Conditions, which the iOS update process sometimes appears to freeze or get stuck on the “Terms and Conditions” agree / disagree screen. If that happens, force quit out of the Settings app and try again. You also may need to restart the iOS device before the Terms and Conditions screen will dismiss properly in some situations. If you have any particular experiences, comments, or thoughts about installing iOS 12.0.1 update on an iPhone or iPad, share them in the comments below. Indicative of what’s to come? More bugs? Maybe when the install process feels like a buggy beta, maybe it’s a good idea to punt on the installation of this update? Uh Oh, we’ll find out what happens next!!! I’m going for it, wish me luck. LOL!!! OK now installing iOS 12.0.1 or rather attempting still…. it finally rebooted and now it’s stuck on the black Apple logo screen and it hasn’t moved at all. The progress bar doesn’t move…. yet at least. Getting a little nervous! For a 70mb update this iOS 12.0.1 is the slowest software update I have ever installed on iPad! Crossing my fingers, hoping it works!!!!! OK finally the iPad rebooted itself again, three reboots in a row, no movement on the progress bar though, weird. And now it has finished installing iOS 12.0.1 but I can’t tell if it’s better yet. I will play with it and determine if there are changes yet. So if your update is SLOW then just WAIT… BECAUSE IT WILL COMPLETE! Now I have iOS 12.0.1 the best iOS 12 release Apple has ever made!! i have an iphone X, and i am an ios beta user, first i deleted the beta profile from my phone setting then i went to apple developer web site to delete my self from the developers program. then i opened settings,general, software update but i did not find the new software , i tried a lot but i had the same result . how i can update my phone over air ? is the link above is suitable for iphone x (gsm) ? If you simply delete the iOS beta profile from the iPhone, then reboot the iPhone, you will find the normal software updates should show up as expected in Settings. That is what I did to get iOS 12.0.1 on my device. You don’t need to leave the developer program but you can do that too. Apple’s updates are ALWAYS slow. Nothing new there ! You erased about 90% of what was on my screen!!!! What kind of update is that????? How do I get back what you deleted??? Jenn, no that did not happen, because you are reading a fan website. There is no possibility that anyone or anything on a fan website erased anything on your screen or deleted anything. You are reading a web site, which is text on a web page, in a web browser app, on your device or computer. A web browser on an iPhone or iPad can not erase or delete anything. Updates can fail, and and updates can be problematic, but that is unrelated to reading a web page. If you broke your device you should restore it from a backup. Maybe you deleted your apps or maybe you closed a web browser window. Who knows, but you do not make it clear. I can guarantee that ranting into a website comment section onto the open internet and throwing absurdities and wild claims out there is not related to your experience, though it’s possible some friendly internet person will offer you free tech support which is typically a paid information technology job that nobody aside from a paid worker is obligated to perform on your behalf. Maybe you could buy device insurance, you probably don’t expect a doctor to perform free services for you. Here’s something comparable: Jenn, you made me burn my bagel this morning!! What kind of bagel maker are you?? How do I get back a normal bagel that YOU burned?? Jenn, you made me stub my toe this morning!!! See that is equally illogical, as you are irrelevant to my breakfast just as much as a third party fan website is irrelevant to whatever your software update woes are. I guess she thought she was writing to Apple here, which is not the case as this is an independent website. Nonetheless, it looks like her apps may have been offloaded to make extra room for the install so she just needs to put them back on. Since iOS 11.4.1, I have been offered the option every time and declined it, but Jenn may have accepted it without knowing exactly what that meant. Offloading apps is not the same as deleting, in that user data related to those apps is preserved and will still be available once the offloaded apps are restored. You’re not addressing Apple here, this is an independent tech website. If you want to get in touch with apple, go to the support section on their own website. Now, as far as your screen, it looks like some of your apps might have been offloaded (which is not the same as deleting because offloading removes the app but preserves its related user data) to make room for the update. iOS has been offering the option before installing an update since iOS 11.4.1 and you may have accepted it without knowing exactly what it meant. If so, all you need to do is restore those apps. iOS12 is IMO the worst version ever, who is the idiot that makes the decisions to change SOP methods we have used for years? Once again SJ rolls in his grave at these atrocious decisions and changes. Apple when will you listen to the people buying and using your products? no way, please switch to an Android phone and a Windows computer. We are all so tired of your constant whining and crying about Apple products. All the readers of this site! Its only days ago iOS 12 was D/L’d and 3.34GB and already a small update. Yeah right, its 3.11GB! It’s costing a fortune in data. Not all have unlimited allowances. It’s only 70mb for me, if you are seeing a 3gb item then you are probably downloading all of iOS 12 rather than the iOS 12.0.1 update. Or maybe you’re getting the IPSW, which makes no sense for 99.99% of iOS users. Looks like you are skipping directly from iOS 11 to 12.0.1, otherwise it should be a much smaller update file. Plug it in, maybe the battery ran down to 0 and won’t turn on? Charge it for a few hours. If it installed over night it may have ran down the battery. Then turn it on, force reboot, etc. If it’s “bricked” (won’t boot up at all) then you can try to restore it with DFU mode and iTunes on a computer. Divna: It’s been plugged in most of the day. I haven’t noted any of the new camera filters when I downloaded OS12 or any of the new emojis with 12.1 on my iPhone 6s plus. Are these features not supported on that phone? They should be. But maybe they are just not on the beta (iOS 12.1 isn’t out to the general public yet). Just found a weird bug on the iOS 12.0.1 keyboard. 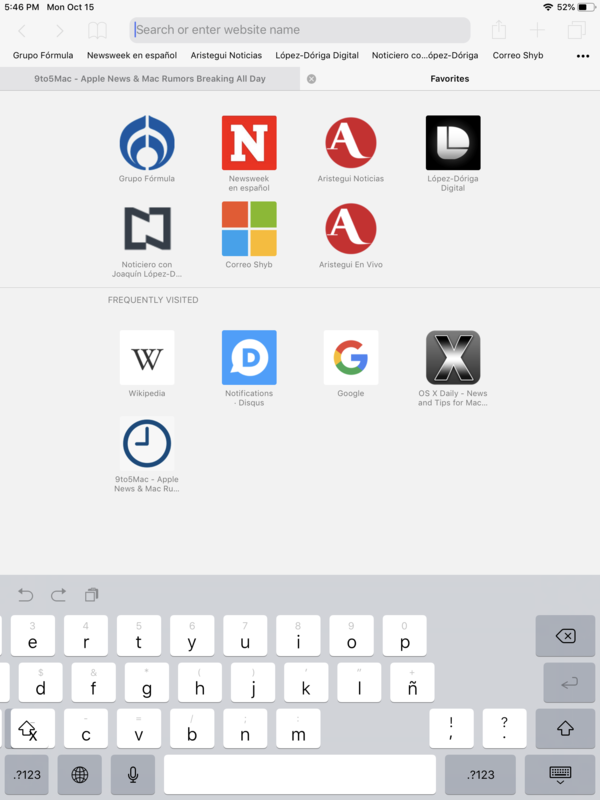 when using the spanish keyboard in portrait orientation, all the keys are moved. No problem in landscape, and no issue in both orientations using the default US english keyboard. Just wondering why these iOS update terms/conditions are delivered in Portuguese when my phone is set to English – when I google this, I see many such related posts so it’s not just a setting issue with my phone – and there is no option to switch the terms to English – appears as if we have to blindly just agree to whatever terms and conditions are actually written there…. I updated from ios11 to 12 on my iphone 8, ipad 6th gen and ipad pro 2nd gen that had the beta, with the pro i had to deleted the beta and reboot, then, the update showed up, took a long time but all is working fine. I updated from ios11 to 12.1.1 on my iphone 8, ipad 6th gen and ipad pro 2nd gen that had the beta, with the pro i had to deleted the beta and reboot, then, the update showed up, took a long time but all is working fine.